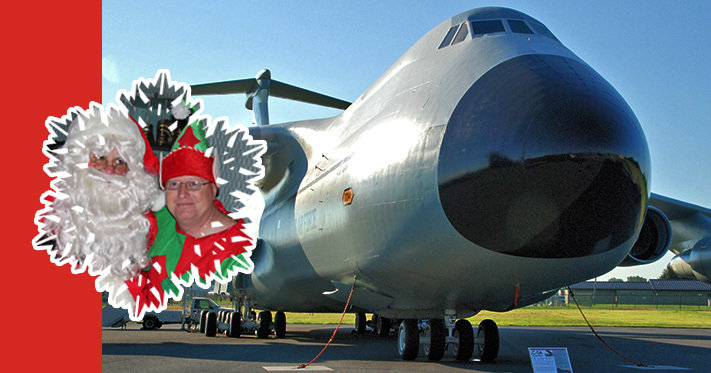 Again this year, Santa Claus will arrive at the AMC Museum and greet children in the C-5A Galaxy cargo compartment. Santa will be letting his reindeer take some time off this season as he upgrades his delivery system to America’s largest airlifter. Children will be able to have their picture taken with Santa on Saturday, December 5th and Saturday, December 12th from 11 a.m. to 2 p.m. aboard the C-5. A donation of $10 for each photo is asked to help keep the entire museum fleet of aircraft shiny and bright. The elves at the museum do all the work but they need paint and polish to do their jobs. While you’re at the museum you can fly one of our free flight simulators and do some holiday shopping in the museum store. Santa is sponsored by the AMC Museum Foundation.